“A Torch Against the Night” Is a #1 New York Times Bestseller! Congratulations to Sabaa Tahir! 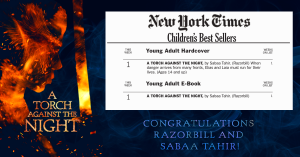 A Torch Against the Night debuted at #1 on the New York Times Young Adult Hardcover Best Sellers list AND #1 on the New York Times Young Adult E-Book Best Sellers list! We had a great time working with the team at Razorbill and Sabaa Tahir!